The weather was atrocious when I finally managed to visit the Tower of London with a friend. After an unseasonably warm October, November has arrived with a splash. It rained non-stop while we were at the Tower. Not gentle rain, or refreshing rain, but relentless, heavy, pounding rain, that ran in waves down the sloping entrance, soaking my shoes and the bottom of my trousers. My daughter has this theory that if it is raining in Barcelona where she lives, it will be dry in London and vice versa. She happened to ring me just as I was leaving the house clad in wellies and mac. But as there was a thunderstorm and heavy rain in Barcelona, she said I wouldn’t need them so I changed. She was wrong. I got soaked! Despite the rain, the Tower was packed with visitors and I was impressed by how cheerful and friendly they were. Most of the people I spoke to in the extremely long queues were from London or nearby counties of Kent and Essex. Some said they hadn’t been to the Tower since they were children on a school visit. Others, like me, had made a day trip involving hours on public transport- coaches, trains, buses and the underground. Travelling, walking, and queuing all in torrential rain. All had made the effort because they were keen to see the installation officially called, “Blood Swept Lands and Seas of Red”, but generally known by the people as ~ The Poppies! Poppies of course are an emotive symbol, used since the 1920s by the Royal British Legion to raise funds for their charitable work, ‘to the memory of the fallen and the future of the living’. Although they are controversial, most people in the UK seem to wear them to show respect for those who fought and died in previous conflicts, and solidarity with those serving in the armed forces today. The tradition was inspired by the poem, In Flanders Fields, by John McCrae. The story goes that when his friend, Alexis Helmer was killed at Ypres in 1915, the Canadian doctor, Major John McCrae, conducted the burial. In his grief he was moved by the beauty of the wild red poppies growing amongst the horror of the graves. The sight inspired McCrae to write this famous poem. The Journalist, Jonathan Jones has been criticised in some quarters of the media for his opinion that the poppies at the Tower of London are “fake, trite and inward-looking – a UKIP-style memorial”, theguardian.com, 28 October). I found his comments shocking, but thought provoking. My impression was of a river of blood flowing around the tower, but outside of the establishment in every sense of the word. Inside, the building protects and reflects power, treasures, pomp, ceremony, privilege, and a dark side to our history ~ cruelty, torture, imprisonment and murder. 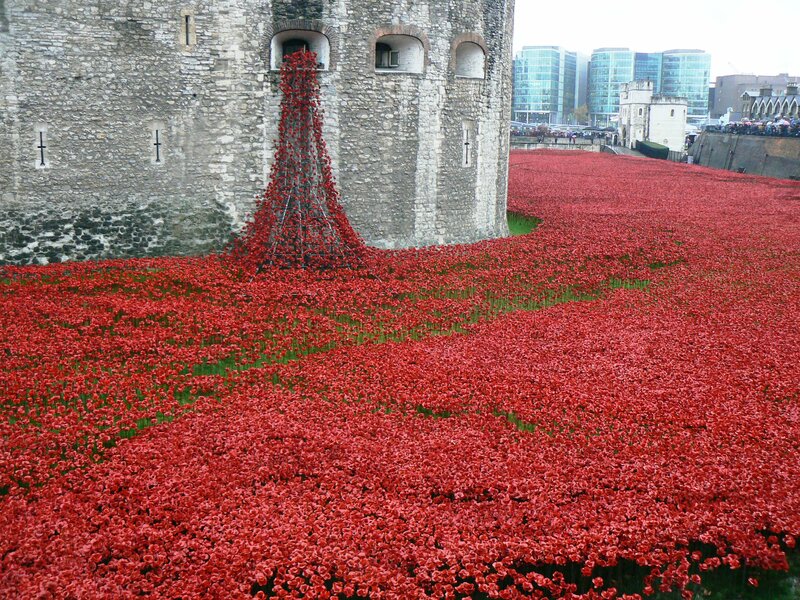 Significantly, many of the people, probably the majority, who came to see the poppies, stayed outside the Tower. It costs quite a lot for an ordinary family to go inside! (Happily almost the whole installation can be seen freely from outside.) I think this is as it should be. The ordinary people came, not to see the grandeur of the Tower, but to be a part of something spectacular yet stunning in its simplicity. They stood good-humoured, all ages and nationalities, helping each other in the pouring rain, humanity at its best, honouring those who died. It was beautiful. I did go into the Tower but it felt alien, as if it had nothing to do with the poppies – except for the Beefeaters. These men have all served at least 22 years in the forces, and must have attained at least the rank of Sergeant Major. They were larger than life characters who wore their immaculate, gorgeous, yet slightly ridiculous uniforms with evident pride and aplomb. Their uniforms were drenched. The rain dripped off them like the tears shed by countless families of the fallen we were there to remember. Somehow this fitted the mood and made it all real. Did those young men stand firm and wear their rain-sodden, mud-soaked uniforms with pride on those dreadful battlefields? There is some talk this week of leaving the poppies in situ for longer. While I don’t agree with this I think it could be very moving to see them standing through the biting winds, mist, murk and mud of a British November. They could then represent the poor, the homeless, the jobless and all the disadvantaged in this very unequal world. If they stayed longer, through the cold, frost and snow of a harsh December, they could represent, the lonely, the sick, the disabled, and the elderly so often at the mercy of exhausted relatives or poorly paid and overworked “carers” in homes and hospitals. Too many of them look forward to death as an escape from suffering, as so many of those young men must have done during WW1. The juxtaposition of the simple poppies outside, and the Crown Jewels inside the Tower was revealing. Considered precious, these ‘priceless’ treasures are displayed in glass cases watched over by security. With soft lighting and controlled temperatures they are guarded in secure rooms sealed by impenetrable metal doors. They reminded me of seeing the embalmed body of Lenin in his mausoleum in Red Square! Would that our young soldiers had been so well cared for on the WW1 battlefields! Unfortunately we seem to have learned little after a hundred years. The most incongruous thing I saw during my visit was a sign, which said you could avoid the queues by paying for membership of something or other. This is exactly what is wrong with our world. Money can buy advantage in every sphere of life. Those with money, power and influence can get the best seats in theatres, tables in restaurants, food, education, housing, healthcare, medical treatment, etc. etc. You name it and you can have it if you have money. The world is still run by a strange elite, a brotherhood, for they are mostly men, who make and adjust the rules to protect and promote their own interests and to feather their own nests. The few prosper at the expense of the many who struggle daily to get and keep a home in which to live and raise their family, to feed, clothe and educate them, and try desperately to stay well enough to not need help in their old age. Only when laws, rules and decisions are made, and actions taken to promote the common good, will the war have been worth it. We are a long way from that yet. There may be no-one living now who actually fought in WW1, but there are countless families who treasure the memory of a relative who did, and this installation has given them an opportunity to remember them and to pass on their history to the next generation. My own grandfather joined up at the start of the war aged just 14 years 8 months and was sent to France as a bugler in 1917, aged 17. Thankfully he survived. But, like many others, he never talked about his wartime experiences. We found out about them when he died many years later and his comrades spoke at his funeral. Since then I have researched his war record and it is astonishing what he went through. To me he was always my lovely granddad who ran a corner shop and let me sit by the fire in the back of the shop eating out of date sweeties and chatting to my much loved granny. I always respected and loved him, but now I admire him for his strength of character and I am proud to be descended from him. This entry was posted in Art, Creativity, Musings, Photography, Remembrance and tagged Blood swept lands and seas of red, Poppies. Bookmark the permalink. So wish I’d gone to see this. Your photos are amazing! A beautiful article with great photos too. It truly is an inspiring sight. Thank yo for the lovely comment and a very happy new year! Lovely post and photos Brenda. I don’t have many childhood memories — but I do remember the poppy drive for Veterans each November (in US) — my dad would loop the poppy above the visor in the car — I would notice it each time I got in his car! Thank you for sharing! I’m so glad it brought back lovely memories for you x thanks for commenting. You’ve managed to encapsulate so much of what I feel and believe about the importance of this exhibition within this post! I’m so, so glad that you included the poems 🙂 I had seen the poppies earlier on as they started to bleed across the lawns, but from above, in the viewing gallery in The Shard. I was so taken with it and desperate to see it up close! Well I finally managed it today, although the crowds were enormous! I ran out of time eventually so didn’t make it down amongst the poppies in the grounds. I think the whole point of this being a temporary exhibit, showing the number of lives that are shed across the world in wars, and the magnitude of the loss of life in the World Wars becomes more poignant when those bright poppies vanish from sight again. I would be happy for them to remain through November, to have a chance to see them again and as you say, for them to be out in the winds and rains. Oh Sarah I hope you didn’t get soaked too! I love your comment about the poppies disappearing – it will be very poignant to see the bare grass again- like all those young men and women just ceasing to exist. I’m glad you enjoyed my post – there will be more on this topic next week.